The integumentary system keeps body temperature within limits even when environmental temperature varies; this is called thermoregulation. The skin’s immense blood supply helps regulate temperature: dilated vessels allow for heat loss, while constricted vessels retain heat. The skin regulates body temperature with its blood supply. The skin assists in homeostasis. Humidity affects thermoregulation by limiting sweat evaporation and thus heat loss. Evaporation: What happens when water crosses the skin via sweat glands and then dissipates into the air; this process cools body temperature to within the body’s tolerance range. homeostasis: The ability of a system or living organism to adjust its internal environment to maintain a stable equilibrium; such as the ability of warm-blooded animals to maintain a constant temperature. vasoconstriction: The constriction (narrowing) of a blood vessel. arrector pili: Any of the small muscles attached to hair follicles in mammals; when the muscles contract they cause the hairs to stand on end. The integumentary system functions in thermoregulation—the ability of an organism to keep its body temperature within certain boundaries—even when the surrounding temperature is very different. This process is one aspect of homeostasis: a dynamic state of stability between an animal’s internal and external environment. 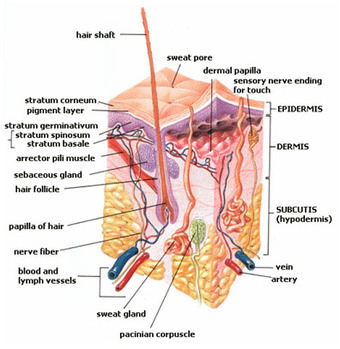 Human skin: This image details the parts of the integumentary system. The skin assists in homeostasis (keeping different aspects of the body constant, e.g., temperature). It does this by reacting differently to hot and cold conditions so that the inner body temperature remains more or less constant. The skin is an incredibly large organ. It is about 2 meters squared (depending on the size of the individual). Owing to its location at the barrier of the environment and our internal selves, and its relatively very large surface area, it is plays an incredibly important role in thermoregulation. This is because in a healthy individual, when all else is held equal, their body is constantly generating heat as a result of its various metabolic and physical processes. At rest, such an individual is expected to increase their body temperature by 1 C every 5 minutes as a result of these processes. Left unregulated, this would kill a person quite quickly. The process of skin-based thermoregulation occurs through several means. The first way involves the abundance of blood vessels found in the dermis, the middle layer of the skin. If the body must cool down, the body vasodilates these blood vessels. Vasodilation refers to the process of expanding (-dilation) the size of the blood vessels (vaso-). The now enlarged peripheral vessels of the skin allow for greater amounts of blood to flow near the surface of the skin. This allows for our body to release a lot of body heat through radiation. Radiation, in this case, refers to thermal radiation, which is the process of transferring heat through space via electromagnetic waves. At the same time, if a fluid such as circulating air or water in a pool comes into contact with the skin when we are very hot, this will allow for heat loss through the process of convection. The higher the amount of our body surface exposed to this (usually) circulating air (e.g. as little clothing as possible), the higher the speed of the circulating air (e.g. it’s really windy), and the smaller the distance between the skin surface and the blood vessels, the greater the loss of heat from our body via convection. If our skin touches a cold object (like a cold drink), then we will lose heat via the process of conduction, which is the direct heat transfer of heat from a hotter surface, to a colder surface touching that hotter surface. The body also thermoregulates via the process of sweating (perspiration). Roughly speaking, sweating begins when the body temperature rises above 37 C. Sweat production can be increased or lowered as necessary. For instance, if we must cool down, sweat production increases. As drops of sweat form on and then evaporate from our skin surface, they take body heat away with them. All else held equal, the greater the skin surface area and the higher the sweat rate, the greater the rate of cooling via sweating. With respect to body heat loss, the processes of radiation and convection are most effective when the environmental temperature is below 20 C, while evaporative cooling accounts for the most heat loss when the environmental temperature is above 20 C, and especially when it’s hotter than 35 C.
Increased humidity, however, limits the ability of our body to dissipate heat via perspiration. The hairs on the skin lie flat and prevent heat from being trapped by the layer of still air between the hairs. This is caused by tiny muscles under the surface of the skin, called arrector pili muscles. When these muscles relax their attached hair follicles are not erect. These flat hairs increase the flow of air next to the skin and increase heat loss by convection. The exact extent to which this process help keep us cool is debated (read below). Anatomy of the skin: The skin is the largest organ of the integumentary system, made up of multiple layers of ectodermal tissue, and guards the underlying muscles, bones, ligaments, and internal organs. On the other hand, if the body needs to prevent the loss of excess heat, such as on a cool day, it will end up constricting the blood vessels of our skin. This process is known as vasoconstriction. Since the blood vessels are narrower than they were before, less blood flows through the skin and thus less heat can escape into the environment via radiation, convection, and conduction. The body will also limit or stop the process of sweating to minimize any evaporative heat loss. In addition, our body thermoregulates using our hair. The arrector pili muscles contract (piloerection) and lift the hair follicles upright. This makes the hairs stand on end, which acts as an insulating layer, trapping heat. This is also how goose bumps are caused, since humans don’t have very much hair and the contracted muscles can easily be seen. While this hair-based method of thermoregulation is effective in many mammals and birds owing to their large and thick amounts of fur and feathers (respectively), the relative effectiveness of this method of thermoregulation in humans is in question since we have little to no body hair in comparison. Finally, while technically not a thermoregulatory mechanism, the fat associated with our skin does help insulate our body and therefore increases body temperature as a result.